(TibetanReview.net, Jun03, 2016) – Apparently with eyes on the commercially lucrative site due to its location, a county official was reported to have led hundreds of Chinese policemen and heavy machinery to demolish commercial sites and homes owned by a Tibetan community by the side of the Qinghai Lake in Qinghai Province on Jun 1. The assault on Tanakma Township in Chabcha (Chinese: Gonghe) County of Tsolho (Hainan) Prefecture was joined by a medical team, reported the Tibetan Service of Radio Free Asia (Washington) Jun1. The report cited a local source as saying the police began demolishing all the structures built by the Tibetan residents on their own land, not allowing them to retrieve their belongings even. The shops and homes had been built by displaced nomads near the path circling a section of the scenic Qinghai Lake. The buildings were said to have been financed with sale of livestock and loans taken from banks or wealthy individuals. The only reason said to have been given by the authorities for the demolition was that they were illegal structures. It was not clear how many structures were razed during the demolition drive. 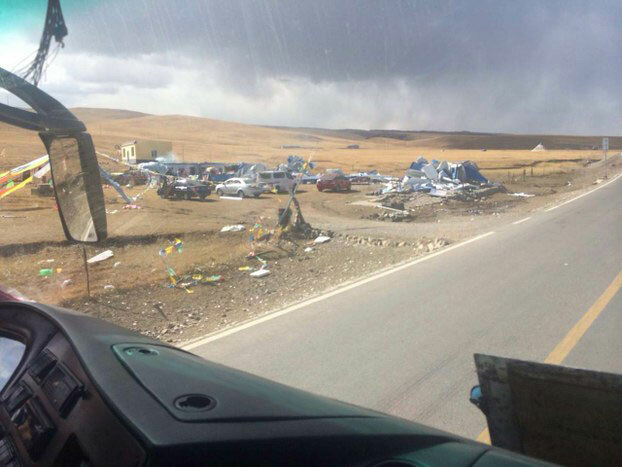 Earlier, in Oct 2015, another Tibetan town in Chabcha County suffered a similar fate, which left over 900 Tibetans homeless, forcing them to live in tents, the report added. The report suggested that the local authorities might have colluded with developers and businesspeople in order to seize the land, a common enough incident in China as well. It said Tibetan landowners in Chabcha were often forced to sell their properties to wealthy businessmen who pay bribes to local authorities to force the transactions. It cited the source as saying Tibetans who resisted the taking over of their land were targeted by county officials who use violence to oust them.